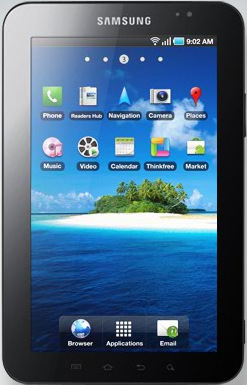 The Galaxy Tab is an Android tablet made by Samsung. Samsung has really gone out of their way to make the Galaxy Tab iPad-like in appearance and interface. I would have prefered a less modified android operating system. Like my Galaxy I7500 phone the Tab requires a crappy windows only program to get updated. As such I have not updated my Tab yet and thus it still runs the original Android 2.2. I like the size of the Tab. It's bigger than a phone so you get more screen area, but it is still possible to hold it in one hand just like a phone. A bigger size (like the iPad) would not allow me to hold it comfortably. The size also allowed me to update BigBrotherGPS so it supports multiple screen sizes.